Bonjou from Haiti! I made it here after some flight delays but arrived here safe. The first couple of days I spent getting settled in. I went to our clinic in Port au prince for a couple of hours each day and started going through all the medical supplies we had stored in boxes there. There were bandage supplies, surgical equipment and lab supplies among lots of other stuff! I am not even ¼ of the way done yet either! So I’ll be spending more time there while I am here in Port au Prince for language school. I have a teacher who comes here in the mornings and does class with me and then he gives me homework. The language is a lot harder than I thought it would be so we’ll see how it all turns out after a couple weeks of schooling.I went to the southern part of the country this weekend. It is more country and village oriented there. It is safer and I like it a lot better b/c I can walk around on my own and see people and play with the kids. I witnessed 5 baptisms in the ocean on Saturday. Some of the people from the church were there and sang hymns that I recognized the tunes to.I attended my 1st Haitian wedding and it was a double wedding. It was interesting. I had no idea what was being said but it was fun to watch all the guests who came. The little girls were in awe of the dresses. I got a surprise after the wedding. We were invited back to one of the huts for the ”reception.” In their culture the best man goes into the house/hut and gives them advice on how to have a successful marriage. In Haiti is the couple has trouble in their wedding the 1st people they go and talk to is the Best Man and Maid of Honor. Then if they still can’t work things out then they go to the minister for counseling. So we walked up the mountain in the dark with a couple flashlights. I would say about 50 of us. Of course I had plenty of help from the Haitians wanting to make sure I got up there OK. I still had no idea what they were saying or singing but it was a lot of fun. The real fun began when we got there and I had to pee. This couple had an outhouse sort of thing and I had toilet paper in my bag (always!) I opened the door to the outhouse which was about 3 feet by 3 feet and there was a chicken laying on her eggs in there! Then I look up on the wall and there was a huge spider of some sort. I really had to pee though so I thought I would bite the bullet and do this. When I opened the top of the seat cockroaches started climbing out! That was my final sign from God not to use this bathroom! I came flying out of the outhouse and told the missionary I was working with that I would just hold it and wait. 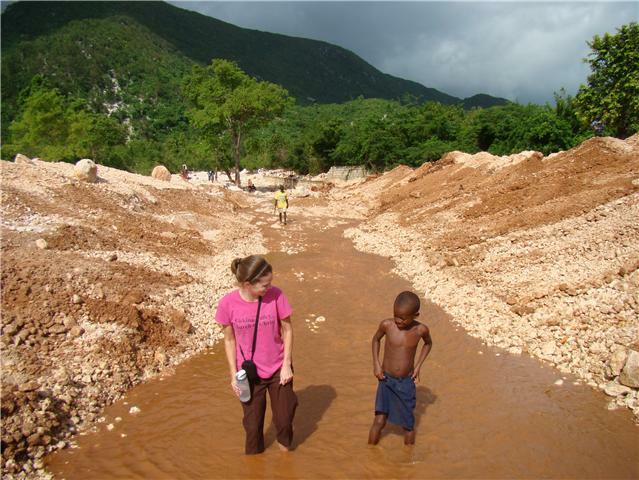 Lesson learned: Always use the bathroom before you leave the house in Haiti. After the wedding celebration we went up to the mountains for a revival our church was having up there. It is about a 3 hour drive there.On Sunday morning they had their “First Fruits” ceremony. The people brought of their harvest for this year to the Lord. It was really neat to see all the vegetables, a chicken and even a sheep! The women brought the offerings down the center aisle and sang while presenting their gifts. The women who sold crackers and cookies on the street brought those and money they had made from selling them this year. The service lasted from 930am until 130pm! I took video that I am hoping to post on YouTube to give you a taste of what it was like. Haiti can not be described in a picture or video you have to see it, smell it, experience it for yourself. Hey! That was some adventure! Now you might understand why I tell the boys "go to the bathroom" before we do anything. Inevitably, that seems to always happen if we forget to remind them. Next time I hear someone complain about "the facilities" anywhere, I'll share your story. The 4 hour service must have tested the old bladder too. Good news! We're going to break freezing Thursday. I can see the pavement in most places now too. Not on the jogging path though, maybe tomorrow. Don't you live in Ohio? Why do you root for a team that's not in your state? Yeah yeah, how many times have I heard that one over the years? Still might rain Friday in Port-au-Prince, if it doesn't you're out of luck for awhile it looks like. God Bless! Wear some sunscreen young lady! So good to hear from you! I'm excited to hear you finally made it for your long mission. Good for you! Looking forward to hearing your updates..they are always so interesting!